The scene in Phoenix Park this morning. 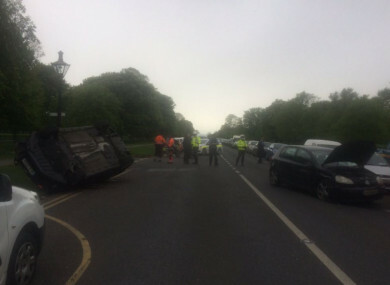 A CAR OVERTURNED following a crash in Phoenix Park in Dublin this morning. The incident happened on the main road running through the park, Chesterfield Avenue, at about 8am. Gardaí attended scene of the collision which involved two vehicles. AA Roadwatch reports that the overturned car is near the entrance to Dublin Zoo with diversions in place along the thoroughfare. Gardaí have said that no injuries were reported following the incident. Email “Car overturns after two-car crash in Dublin's Phoenix Park”. Feedback on “Car overturns after two-car crash in Dublin's Phoenix Park”.